Keeping your author blog current and engaging has many benefits: It improves your site rank in search engines, helps solidify your reputation as a professional writer, strengthens your author platform, and attracts new fans. But sometimes it’s hard to find the time, focus, and energy to keep your author website’s blog updated regularly with new posts. Here are some tips to help you stay motivated, energized, and on track! Be consistent. Whether you choose to post twice a month or twice a week, make sure you stick to your plan. Be realistic—if you set the bar too high, you’ll find yourself either giving up entirely or falling prey to the dreaded blogging burnout bug. Create a schedule. Set aside time in your schedule just for blogging. Treat that time as if it was an important appointment that, as a professional, you’d never miss. Create a list of topics. With a little brainstorming, you should be able to come up with an extensive list of topics to keep in your writing queue. Then, when you’re floundering for inspiration, you’ll always have an idea readily available. Or check out our 40 blog ideas for creative writers. Remember: Posts that correspond to the time of year, holidays, book signings, or other current events can be blogging gold mines. Create an editorial calendar. Use a calendar to schedule your blog ideas for the next few weeks, months, or even the whole year. At a glance you’ll know what topic you’ll be writing about and when to publish it. You can even keep track of keywords and coordinate other social media updates accordingly. Check out this free editorial calendar template! Reblog. Ask your favorite bloggers if they will allow you to repost their original content on your blog. Often, they’re happy to permit reposts with due credit. You’re even welcome to repost our articles! Jot down ideas as they come. Carry a notepad wherever you go. Inspiration can strike at the bowling alley, the dog park, or on the subway—so be ready! Call in the cavalry. Ask a fellow writer to guest blog for you or to answer interview-style questions. Invite a guest book reviewer, local writer, or teacher to blog on your site. Your guest bloggers will appreciate the exposure, your readers will enjoy a different point of view, and you can focus on creating quality posts of your own. Keep it short, sweet, and simple. Don’t overthink your posts. Remember: Blog posts can be casual, short, and light. In fact, the majority of blog readers tend to prefer posts that aren’t too long or complex. Find a partner. Sometimes it’s easier to break a bad habit (or start a good one) with an accountability partner—someone who will help keep you on track with your blogging goals. Still suffering from blog burnout? We understand that some writers simply aren’t into blogging. But if you want to build a solid readership on your website, it’s important to identify what’s stopping you from contributing regularly to your author blog. Are you feeling insecure about your writing? Ask for feedback and/or assurance from other writers or people in the industry you trust. And check out our page on Motivation, Encouragement, and Inspiration for Writers! Think you’re too curmudgeonly or introverted (or fill in the blank) to maintain a popular, upbeat blog? Remember that your personality will shine through honest writing, and people are either going to love you as you are or follow someone else. Cranky and cantankerous can be downright entertaining if done in an amusing way—just ask Grumpy Cat! Afraid of the commitment? Sure, you’re busy—and who knows what the coming months will bring? But if you don’t post regular content to your blog, a) new readers will not be driven to your site and b) the readers you do have will begin to fall away. Don’t overthink: Focus on one blog article at a time. Are you discouraged by a lack of results? Instant gratification is nice, but it takes time and patience (and yes, regular blogging!) to build up readership. Check out our resources for Online Marketing and Promotion for Writers and fine-tune your blog accordingly. QUESTION: Where do you find the motivation to keep your author blog on track? I signed up for a 30-day blogging challenge (and a 30 day writing challenge as well) for the month of August because I needed to force myself back to a regular writing schedule, and worse than that I am all those bad-blogger examples you mentioned! Mostly, I felt I couldn’t find my blogging voice. 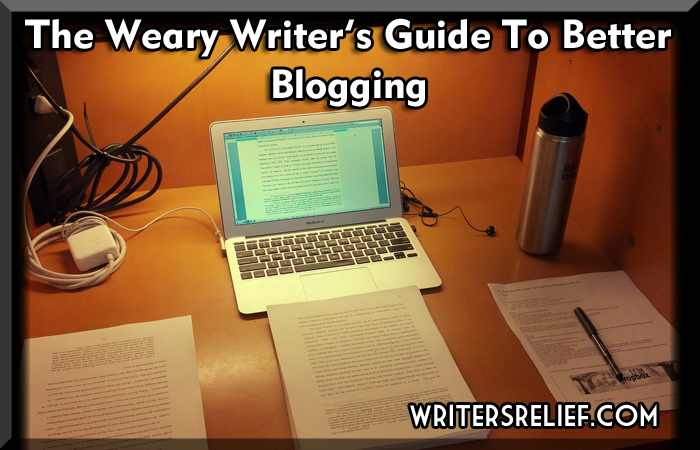 Fiction is one thing, blogging is another. Blogging challenges force you to quickly devise a response to their topics without overthinking them, and Surprise! it gets easier. And another surprise, I’m getting positive results I never believed would happen this fast. Not surprising? The most reader-enjoyed posts so far are those written more like scenes from a book. That allows my voice to show, and its been mentioned in comments several times. This will definitely change the way I blog, and is making it more fun as well. I determine my blog schedule prior to January 1st every year, then announce it on the last December post. It keeps me on track. I draft out posts and schedule them when inspiration strikes.